Speedsters Maury Wills, Willie Davis, Davey Lopes, Steve Sax and other Dodger players scampering around the bases at Dodger Stadium have been a familiar sight to fans, but what about a horse running those same bases for an inside-the-park home run? That was exactly what happened when famed television series “Mr. 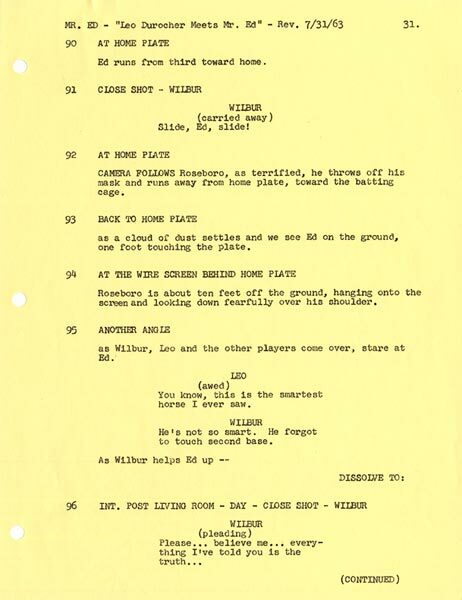 Ed” visited Dodger Stadium for filming in June 1963. The episode titled “Leo Durocher Meets Mr. Ed” initially aired on September 29, 1963, starring Alan Young (who plays architect “Wilbur Post”). In June 1997, when TV Guide named its “100 Greatest TV Episodes of All-Time,” that particular “Mr. Ed” show was ranked 73rd on the list. 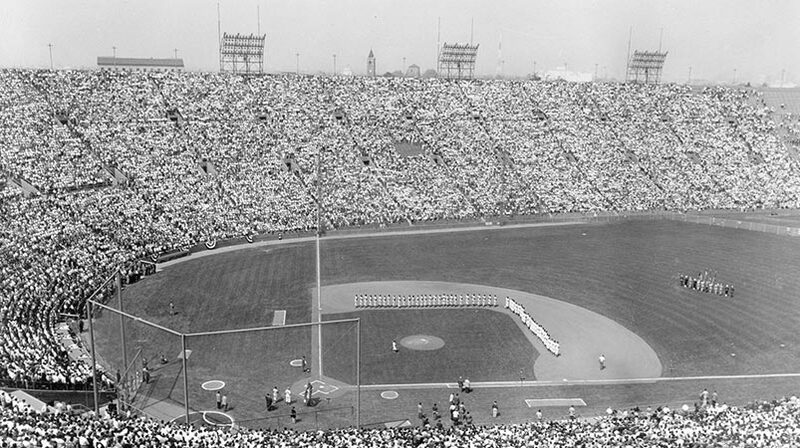 Starting with Walter O’Malley’s desire to utilize Dodger Stadium for other activities on a limited basis, through the years the ballpark and its grounds have provided a popular setting for Hollywood movie and television production companies to shoot on location. Some of the productions include Elvis Presley filming car racing sequences in the 1966 movie “Spinout” in the Parking Lot; “Felony Squad” TV series the late 1960s; “The Omega Man” thriller starring Charlton Heston in 1971; scenes from “The Naked Gun” movie starring Leslie Nielsen in 1988; scenes from “Talent for the Game” featuring Edward James Olmos in 1991; scenes from “Angels in the Outfield” in 1994; scenes from “For Love of the Game” in 1999 starring Kevin Costner and Kelly Preston; scenes from “Bounce” in 2000 with Ben Affleck and Gwyneth Paltrow; and scenes from “Superman Returns” in 2006. Many commercials have also been shot at Dodger Stadium and in the Parking Lot, including Union 76 spots with Dodger broadcasters Vin Scully and Jerry Doggett. Several Dodgers appeared as themselves on the “Mr. Ed” episode including Durocher (who served as a coach for Manager Walter Alston from 1961-64), Sandy Koufax, Willie Davis, John Roseboro and Bill “Moose” Skowron. Scully’s voice is also heard describing a fictitious Dodger game in the show. After Mr. Ed has the horse sense to ask an operator to dial San Francisco’s Candlestick Park and be connected with Durocher, he offers him batting tips for Davis. When Davis makes the adjustment and surprisingly hits a game-winning home run, Durocher seeks more advice for the team. 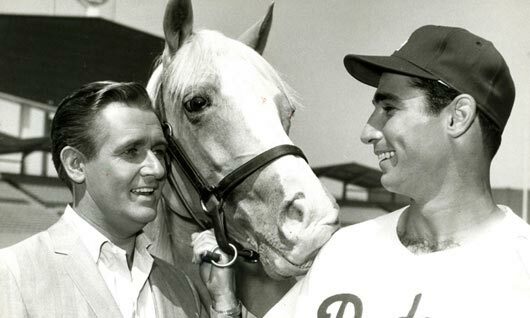 Mr. Ed and Wilbur are invited to visit Dodger Stadium. More tips ensue, before Mr. Ed takes batting practice himself and, with bat in mouth, slugs one against superstar hurler Koufax, then gallops around the bases and slides home safely, as terrified catcher Roseboro hastily retreats to the back of the batting cage to avoid him. Click image for a larger viewActor Alan Young, “Mr. 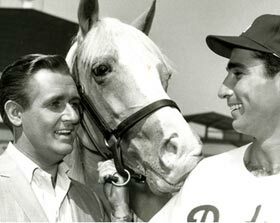 Ed” and Dodger star pitcher Sandy Koufax were part of the 1963 episode “Leo Durocher Meets Mr. Ed” filmed at Dodger Stadium. 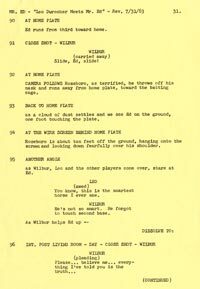 Click image for a larger viewA page from the original 1963 script of the television series “Mr. Ed” filmed at Dodger Stadium, starring several Dodgers.